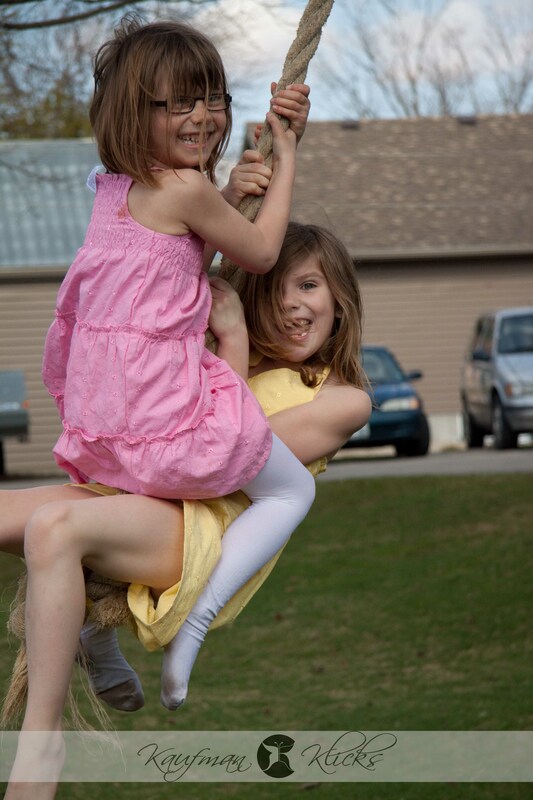 Swinging Around with the Krabbe Girls! On Easter weekend, with all it’s beauty and warm weather, I was able to head out for a morning with the Krabbe Girls. We headed over to a friends house here in Listowel and got to swing around with this awesome rope swing and old tree. The girls had a total BLAST! I have had the opportunity to really get to know these two girls in the last few years and if I had to describe them with one word it would be PLAYFUL!!! They play all the time, and they play hard… Their imagination sets them apart from everyone else. That is why this shoot was so much fun for me because we all got to have fun and be a kid again for a short while. Although we did a lot of fun shots on the rope swing, I happened to notice a lovely red barn in the back yard as well. With the girls white dresses I could not resist in heading over to the barn. These are some of my favourite pictures that I have taken, they show how much these two really love each other as sisters. Next we moved into some fun spring colours and got out the big flowers. It just so happened that the big flowers I brought matched their outfits perfectly!!! We smelt the flowers, chased each other and wore them as hats. Many laughs were had during this part, and because of their imagination and creativity we all had fun! Finally, the girls ended back on the swing. It was a challenge to keep them off for some of the above pictures, but they were very cooperative and eventually got to get back to the swing! Thanks Cathy and Mark for letting me photograph your girls. They really are “best friends and sisters”. Next Mia and the Puddles. Awesome pics Nicole…..the girls look amazing….I love the one in front of the doors!!! Thanks sooo much Julie. I had a great time with those two fun loving girls!